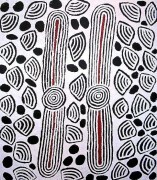 Ningura Napurrula was born at Watulka, south of Kiwirrkura, Western Australia c.1938 and sadly passed away in 2013. Ningura was the wife of Yala Yala Gibbs Tjungurrayi, a highly respected Pintupi elder who held significant knowledge of his country’s dreaming stories. Ningura achieved great success in her painting career. Her work is featured in the Musée du Quai Branly building, Paris, France and her artwork was selected for an Australia Post stamp in 2002. She was a finalist in the 2001 Telstra Art Award and was highly commended in the 2002 Alice Springs Art Prize. 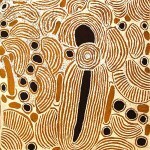 Ningura also participated in a collaborative painting with senior Pintupi women which was included in the Papunya Tula: Genesis and Genius exhibition at the Art Gallery of NSW, Sydney, 2000.